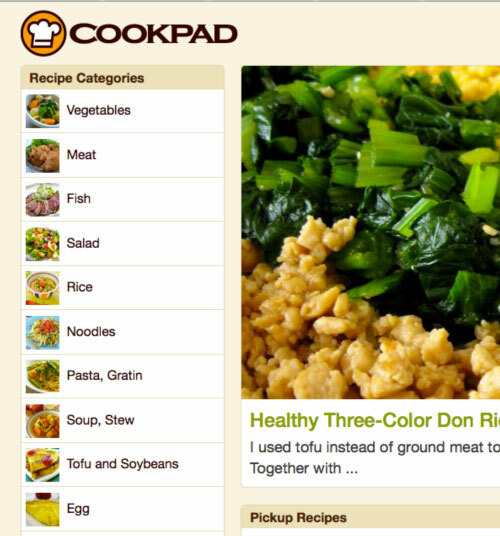 Cookpad is the largest recipe site and cooking community in Japan, with millions of contributed recipes. It just launched an English version of the site today. About 1600 recipes have been translated from the Japanese site already, with many more promised. All the recipes are translated by humans, not machine-translated, so they're human-readable too! As with the original Japanese site most steps are illustrated with little photos, which are very handy. If you're interested in everyday Japanese home cooking, it promises to be a valuable resource. The vast majority of the recipes are of the quick and easy type, made by busy moms and other women, and a few men too. The recipes are not limited to stereotypically Japanese ones - they cover the whole gamut of home cooking in Japan, and many types of cuisines. Some ingredients may be strange and unfamiliar to you - after all they are everyday ingredients in Japan, perhaps not elsewhere (although you can find descriptions for many of them right here on this site). But at the very least, they offer a fascinating look into what Japanese people eat at home, and you'll probably find some interesting recipes to try out too. I hope to have a more in-depth look at the launch of English version of Cookpad soon, but in the meantime, go over and take a look! ETA: I've noticed a few typos and such here and there. I've corrected what I can, but with so many recipes already I can't see them all. As I mentioned above, all the recipes are human-translated, which means that a few mistakes will sneak through. If you spot any, use the Feedback box at the bottom of each page and they should be corrected - by humans - eventually. Submitted by maki on 2013-08-05 13:23. yEAH!!! SOME OF THE TRANSLATIONS WERE VERY ROUGH ON THE NIHONGO SITE. Thank you for sharing! This looks like it's going to be very useful. Think I'll be busy for the next couple of hours hahahaha. Thank you for sharing this, Maki! Have you ever shared your recipes on the Japanese site by the way? Oh my goodness! Best thing to happen so far in 2013! Thank you for sharing! I've been hoping and hoping to be able to cook recipes from Cookpad. We love homestyle Japanese food but I can't read enough kanji to use Japanese cookbooks. This is so exciting! Very very cool. This site is now booked-marked on my tablet. Thanks for sharing! suddenly. Thank you for this "almost home" site. I don't particularly have any difficulties with the Japanese version of Cookpad because I've been using it for over a year now, but this English version is WOW! This makes it easier for people who can't read Japanese but want to learn Japanese cooking. Thanks Maki, I am so excited about this site!! I love it that it's recipes by everyday people. Went straight to the "creative donburi" section...(^_^) lovely! My only gripe is that I can't see a way that I can follow or find recipes by a specific person? Once I find a great recipe I'm always keen to find out what else s/he is up to! What a great resource! Thank you for posting about it. I can't even tell you how this thrills me! With school starting here very soon, my intense focus on Bento boxes returns and I am interested in how other people eat! This window into home life in Japan is so intriguing. Thanks for sharing! ALso, I owe you a debt of gratitude. Several years ago I found your sight quite by accident when I thought, "what is a bento box?" and your site (JustBento) turned up in my Google search. You were my first intro to Bento and still are my favorite cook; we must have similar taste in food. We now have a "bento lifestyle" and my family of 7 are all well versed in not only bento box foods but eating with chopsticks! I took a new job this year and all my workmates have complimented me on my healthy and beautiful lunches. YOU are my inspiration. Thank you. I just checked it out and had a wonderful dinner thanks to it and your site! Since it's still developing, of course this site still knocks it out of the ball park but I like that the have a very eclectic assortment and they're really simple...I think I made dinner in like 15 mins! This is great news! I always ran the site through Google Translate, but like you said, it's hard to read a machine translation. Thank you so much for posting this! What a fantastic website! I have already tried a couple of recipes and they were very simple yet very delicious. Can't wait to try more! It is nice to see these recipes becoming available in English. I went to cooking school while living in Japan and learned how to read Japanese recipes with no problem now. Do they need anyone else to translate recipes? I would love to get involved! The About page says they're looking for more translators - https://en.cookpad.com/about Give them a shout! Do you think they will put the English in their iPad version? I was also amused that most of the recipes I look at have been either translated or edited by Makikowi - who I assume is you. ^_^ Thanks for finding the time to do this. How could I have missed this precious Japanese cooking resource! This must be the most comprehensive, well designed and pleasant Japanese recipe site I have ever seen. And indeed the human translations are highly skillful, which is not obvious at all since translations between the two language can be rather difficult. It shows that Japanese can do webdesign, they should be proud! Having together, both the Japanese and English I can practice languages as well. Thanks so much for sharing this with us! The English cookpad site seems to have changed, do you know how we can access and search for the translated recipes now?